Her Eminence Mindrolling Jetsün Khandro Rinpoche was born Tsering Paldrön, the eldest daughter of Kyabje Mindrolling Trichen Gyurme Künzang Wangyal, the 11th throne holder of the renowned Mindrolling lineage, one of the six main Nyingma lineages of Tibetan Buddhism. Throughout its history, some of the greatest masters of their time have been born within the Mindrolling lineage including the unique lineage of female masters known as the Jetsünma line, a remarkable Mindrolling tradition. Mindrolling Jetsün Khandro Rinpoche was recognized by His Holiness the 16th Gyalwang Karmapa as the reincarnation of the great Dakini of Tshurphu, Khandro Orgyen Tsomo, the consort of the 15th Karmapa, and a respected and revered female master who spent most of her life in retreat. 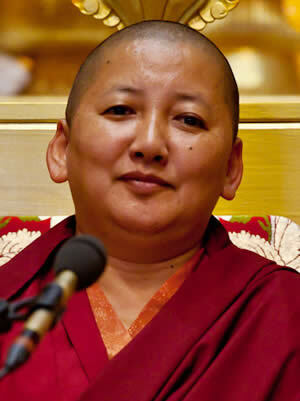 Thus, Jetsün Khandro Rinpoche, as a Jetsünma within the Mindrolling lineage and a tulku within the Kagyu lineage holds both the Nyingma and Kagyu lineages.